Can’t believe the big man is 9 already. Seems like just yesterday that we met when he was only 3 years old. His personality is as big as his heart…and his head. Looking forward to this year and can’t wait to see what it has in store for us. We are just a little over a week away from heading down centerline in our attempt to claim a Bronze Medal from USDF. If you had asked me six years ago if I thought this might even be possible, I would have snorted with a hint of derision and skipped on my merry way. It was spring six years ago when I was faced with retiring Cigar and my future in dressage was uncertain. 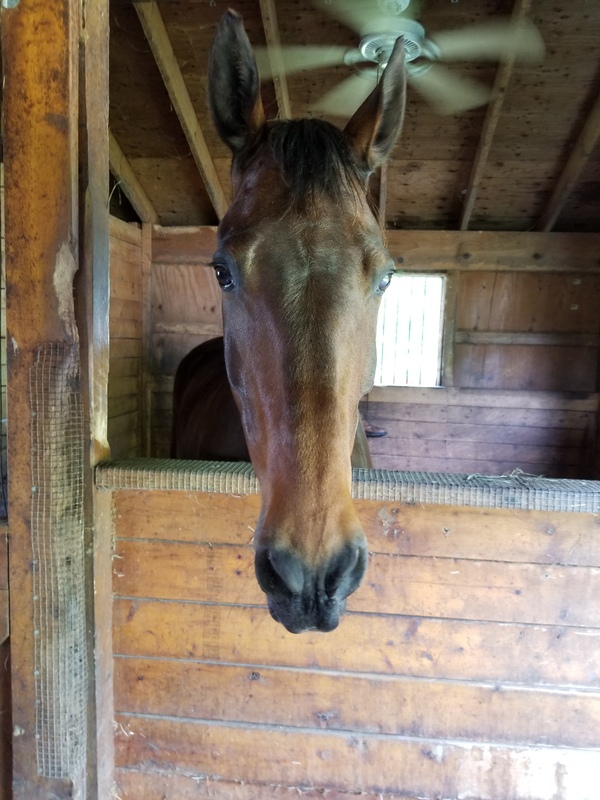 I was riding Ms. C’s Hanoverian mare who let me know in no uncertain terms that she had no desire to leave the farm. Lots of uncertainty and I would not meet Ike until late July. Showing at a schooling show was not in the cards since Miss Willow would not load. A Magic 8 Ball would have said “Definitely No” for a Bronze Medal. There has been a lot of learning the past six years. It sometimes feels like I really didn’t start to understand the nuances of the sport until last year. Cigar taught me many things, but sitting trot, half pass, and collection were not among the lessons. But now here we are teetering at the finish line for that elusive medal. It might not happen next weekend, but the possibility for success this year is real. We had a solid lesson today with Ms. C. Ike is back working in his snaffle. For many things, we are better without the double bridle. I am still learning to be a little more subtle in my use of the curb. I tend to keep just a wee bit too much contact with the curb which impacts Ike’s ability to bend his neck and his ability to maintain good jump and throughness in his canter…and as you can guess, the lack of bend is bad for our half pass and the lack of jump ruins our flying changes. Oh the struggle is real. Thankfully we don’t need the “braking power” of the curb we needed over the winter. This weekend we will head to a clinic with Michael Bragdell from Hilltop Farm. The game plan is to ask for some help and suggestions with our half pass work. Ike has a really good half pass in him; we just need to figure out how to get me out of his way. There will probably be no miracle cures, but it should be a nice outing at my friend’s farm. Hoping for some sunshine and moderate temperatures next weekend. Anyone have an in with Mother Nature?